The current villa is only a small part of the building designed in 1550 by many architects and craftsmen involved in the implementation by Pope Julius III. Ammannati, Vasari, Vignola and Michelangelo all worked there, and large sums were paid by the Pope to make the villa beautiful. The villa was divided up after the Pope's death, and the main building as well as part of the gardens became the property of the Apostolic Chamber. It was restored in 1769 on initiative of Pope Clemet XIV. 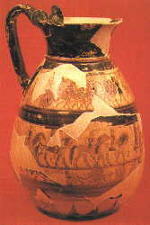 It became the property of the Reign of Italy in 1870 and was made a Museums for Etruscan Art at the end of the century.